As technology improves our lives, we seem destined to witness a parallel rise in fear-mongering. Unfortunately the jury is still out on whether mobile phones can lead to brain cancer, but studies suggest it’s so. Teo’s name appears on a submission recently sent to the United Nations. If you Google “Charlie Teo and mobile phones” you will see that his public statements on this issue go back years. We are scientists engaged in the study of biological and health effects of non-ionizing electromagnetic fields (EMF). Based upon peer-reviewed, published research, we have serious concerns regarding the ubiquitous and increasing exposure to EMF generated by electric and wireless devices. These include – but are not limited to – radiofrequency radiation (RFR) emitting devices, such as cellular and cordless phones and their base stations, Wi-Fi, broadcast antennas, smart meters, and baby monitors as well as electric devices and infra-structures [sic] used in the delivery of electricity that generate extremely-low frequency electromagnetic field (ELF EMF). That list just about covers off every facet of modern life: the internet, phones, radio, television and any smart technology. It’s a list the Amish and reclusive communities of “wifi refugees” know all about. Other than those living in the remotest of remote locations, there are very few in Australia today who are not bathed in electromagnetic fields and radiofrequency radiation, 24 hours a day. My mobile phone shows me that my house is exposed to the wifi systems of six neighbours’ houses as well as my own. Public wifi hotspots are rapidly increasing. The first mobile phone call in Australia was made over 28 years ago on February 23, 1987. In December 2013, there were some 30.2 million mobile phones being used in a population of 22.7 million people. Predictions are that there will be 5.9 billion smartphone users globally within four years. There are now more than 100 nations which have more mobile phones than population. So while Australia has become saturated in electromagnetic field radiation over the past quarter century, what has happened to cancer rates? Brain cancer is Teo’s surgical speciality and the cancer site that attracts nearly all of the mobile phone panic attention. In 1987 the age-adjusted incidence rate of brain cancer in Australia per 100,000 people was 6.6. In 2011, the most recent year for which national data is available, the rate was 7.3. 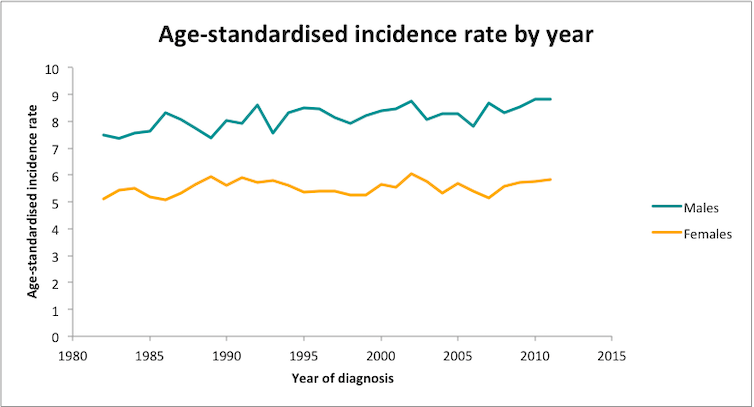 The graph below shows brain cancer incidence has all but flat-lined across the 29 years for which data are available. All cancer is notifiable in Australia. Brain cancers are a relatively uncommon group of cancers: their 7.3 per 100,000 incidence compares with female breast (116), colorectal (61.5) and lung cancer (42.5). There is no epidemic of brain cancer, let alone mobile phone caused brain cancer. The Cancer Council explicitly rejects the link. This US National Cancer Institute fact sheet summarises current research, highlighting rather different conclusions than Charlie Teo. Another Australian signatory of the submission, Priyanka Bandara, describes herself as an “Independent Environmental Health Educator/Researcher; Advisor, Environmental Health Trust and Doctors for Safer Schools”. Last year, a former student of mine asked to meet with me to discuss wifi on our university campus. She arrived at my office with Bandara who looked worried as she ran a EMF meter over my room. I was being pickled in it, apparently. Her pitch to me was one I have encountered many times before. The key ingredients are that there are now lots of highly credentialed scientists who are deeply concerned about a particular problem, here wifi. These scientists have published [pick a very large number] of “peer reviewed” research papers about the problem. Peer review often turns out to be having like-minded people from their networks, typically with words like “former”, “leading”, “senior” next to their names, write gushing appraisals of often unpublished reports. The neo-Galilean narrative then moves to how this information is all being suppressed by the web of influence of vested industrial interests. These interests are arranging for scientists to be sacked, suppressing publication of alarming reports, and preventing many scientists from speaking out in fear. Case reports of individuals claiming to be harmed and suffering Old Testament-length lists of symptoms as a result of exposure are then publicised. Here’s one for smart meters, strikingly similar to the 240+ symptom list for “wind turbine syndrome”. Almost any symptom is attributed to exposure. Historical parallels with the conduct of the tobacco and asbestos industries and Big Pharma are then made. The argument runs “we understand the history of suppression and denial with these industries and this new issue is now experiencing the same”. There is no room for considering that the claims about the new issue might just be claptrap and that the industries affected by the circulation of false and dangerous nonsense might understandably want to stamp on it. Wireless technologies are sweeping across schools exposing young children to microwave radiation. This is not in line with the Precautionary Principle. A typical classroom with 25 WiFi enabled tablets/laptops (each operating at 0.2 W) generates in five hours about the same microwave radiation output as a typical microwave oven (at 800 W)in two minutes. 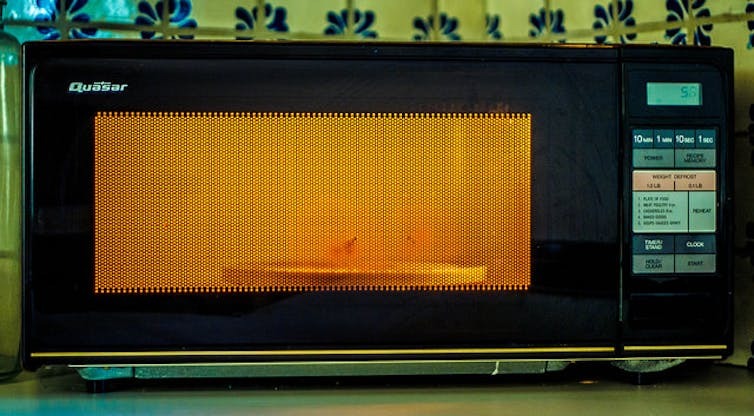 Would you like to microwave your child for two minutes (without causing heating as it is done very slowly using lower power) daily? There can be serious consequences of alarming people about infinitesimally small, effectively non-existent risks. This rural Victorian news story features a woman so convinced that transmission towers are harming her that she covers her head in a “protective” cloth cape. This woman was so alarmed about the electricity smart meter at her house that she had her electricity cut off, causing her teenage daughter to study by candlelight. Yet she is shown being interviewed by a wireless microphone. Mobile phones have played important roles in rapid response to life-saving emergencies. Reducing access to wireless technology would have incalculable effects in billions of people’s lives, many profoundly negative. Exposing people to fearful messages about wifi has been experimentally demonstrated to increase symptom reportage when subjects were later exposed to sham wifi. Such fears can precipitate contact with charlatans readily found on the internet who will come to your house, wave meters around and frighten the gullible into purchasing magic room paint, protective clothing, bed materials and other snake-oil at exorbitant prices. As exponential improvements in technology improve the lifestyles and well-being of the world’s population, we seem destined to witness an inexorable parallel rise in fear-mongering about these benefits. PreviousPrevious post:How secure is your smartphone’s lock screen? NextNext post:Computers to humans: Shall we play a game?